One of our favorite family traditions is setting up a special Christmas tree each year just for our kids that we decorate together with homemade decorations. 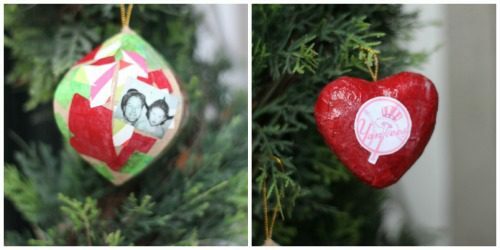 The kids get to choose the tree, and then, help create ornaments all throughout the holiday season. Today, I am excited to share a set of simple ornaments that we created to showcase favorite things and favorite moments from the year. 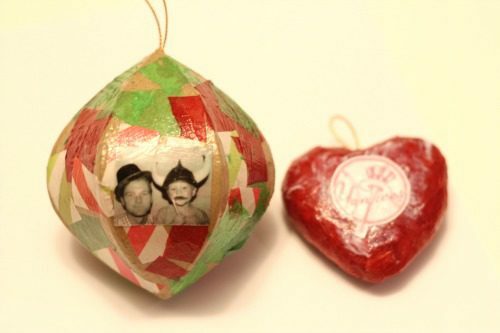 Gather photos, images, and stickers of your family’s favorite things for this year and make an ornament of your very own. 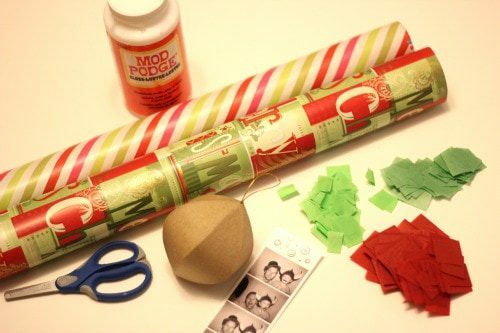 Cut up tissue paper, wrapping paper, and any pictures of “favorite things” into small pieces (1/2 inch to 1 inch). Cover the base ornament with Modge Podge and stick the papers and pictures onto it. Cover the papers and pictures with another layer or two of Modge Podge so that they flatten out and stick to the ornament. Add any other embellishments (ribbon, sequins, etc.) and hang on your tree! One of the ornaments we created displays my 4-year-old son’s absolute favorite day of 2012- Take Your Child to Work Day at YouTube. He got to spend the whole day at work with his dad, and there was even a darling photo booth set up where they could take pictures together with props. The ornament shows off several goofy pictures from that day. Another ornament showcases our family’s favorite baseball teams (the NY Yankees and SF Giants). Several others show the current things my son and daughter are obsessed with- rockets, volcanoes, cats, and Max & Ruby. I love having ornaments on our children’s tree that tell the story of our family from the previous year. 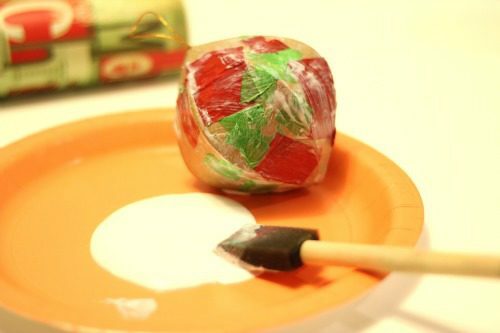 Do you create homemade ornaments for your Christmas tree? Do you have one Christmas tree or several in your house? 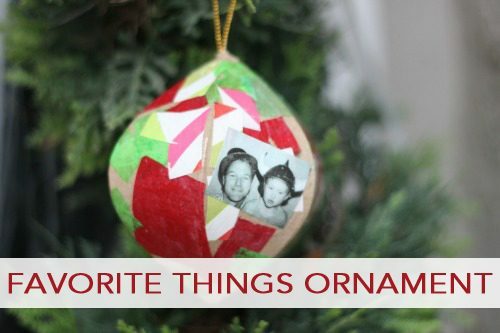 What favorite things or events would your child include on their ornaments? Kristina Buskirk is a mom of 3 and a former Special Ed teacher for children with communication disabilities. She blogs at Toddler Approved as she looks for ways to make life a little more fun and creative with her kids while embedding learning into everything that she does.